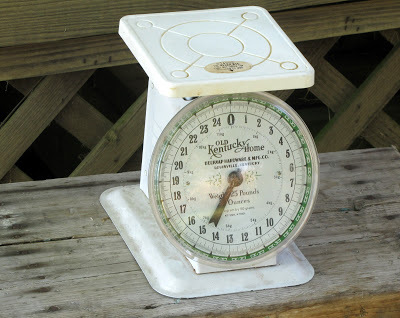 Do you remember this old scale that I picked up at the thrift store? and traded out the broken pointer for an unbroken one that I had on another scale. I like it so much better red. 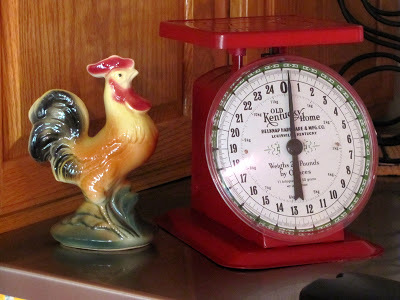 It now resides on top of my refrigerator along with another thrift store find – Mr. Rooster. 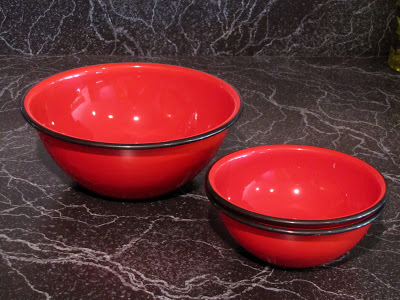 and some non-vintage enamelware bowls that I bought at Lehman’s Hardware. BTW, if you ever have a chance to go to Lehman’s you should stop by. It is a very unique hardware store that caters to the local Amish and other people who don’t use electricity. 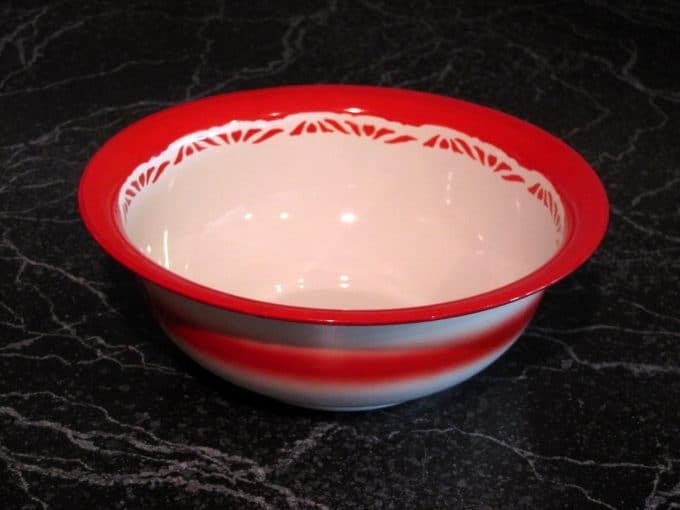 And this bowl which is my favorite bowl in the whole wide world of bowls. It is a vintage enamelware bowl from the 50’s. 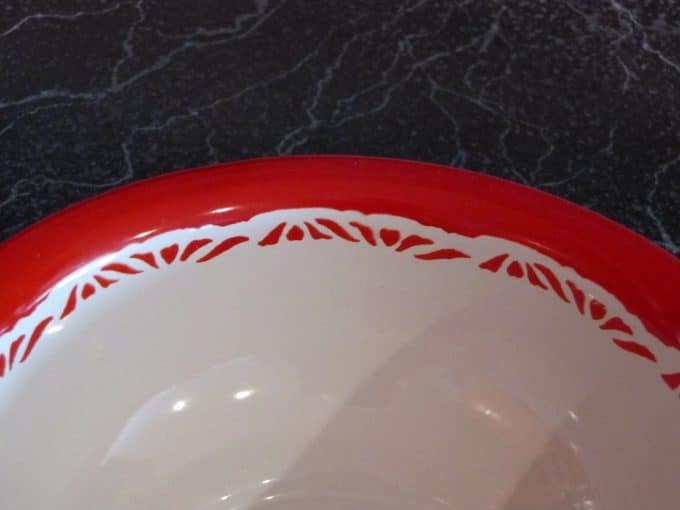 It has a cute retro design on it. 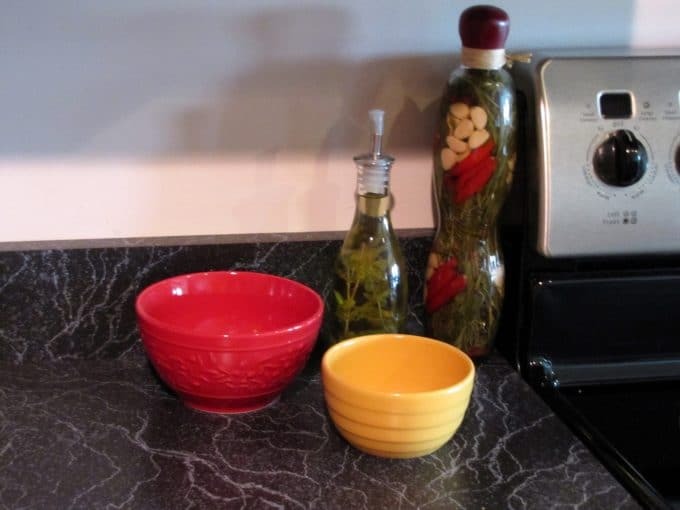 It’s a great size for pasta salad or popcorn. It is a great size for ice cream also, but it gets VERY cold and it hurts your hands to hold it while eating ice cream out of it. That metal is super duper conductive. 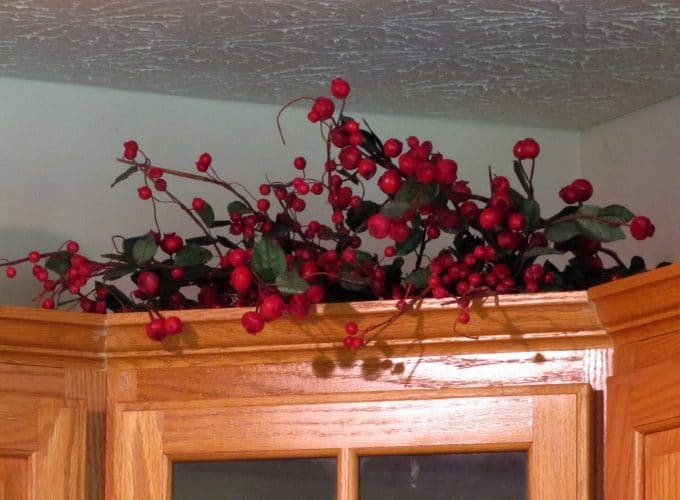 I have red berries on top of my cabinet in the corner. 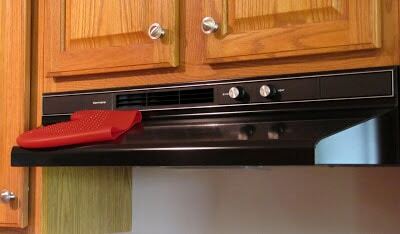 And if you want to get technical, I have a silicon mitt on my stove hood that is red. It’s a guy thing. My husband likes to keep it there. I move it. It finds its way back there. Stop on over at It’s a Very Cherry World‘s REDnesday get-together for some more redness. *Edited to add – Greg, the Ecommerce Director at Lehman’s stopped by. He commented that “we also serve people who are looking to be more self sustained, people who are trying to be a bit more green, folks that look for things that they didn’t think were made anymore, etc”. Thanks for stopping by Greg and clearing up one of the great mysteries! Pam, the scale turned out wonderful!! 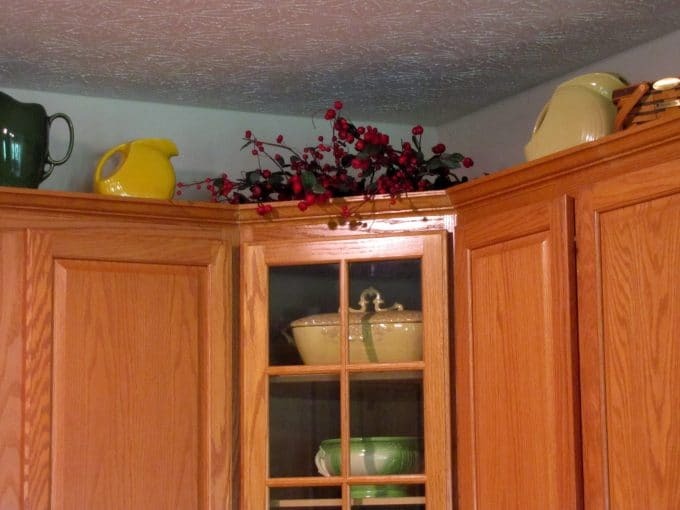 And I love all the touches of red through out your kitchen. Pam, I love all your reds. The redo on the scale is great-I never hesitate to paint something-especially red! It does looks so much cuter in red.Your kitchen has wonderful touched throughout. Happy Reds! Love your red and yellow! My daughter uses that same combination. You have done it extremely well here. I look forward to browsing your beautiful blog. It looks so much brighter painted red, good job! Love it in Red….mine is an antique and it is metal and perfect condition too, with the tin tray on top:) I would never know yours was not. Loving all your Reds! Love, love, love the red scale!!! I have a rusted vintage one and I am going to paint it too. 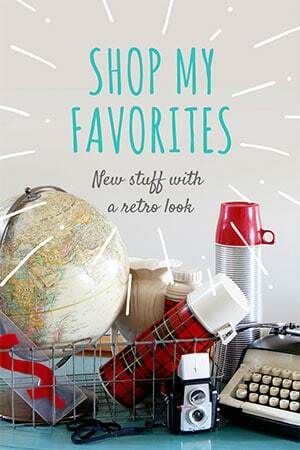 Even as a vintage piece the most it is worth would be around $15 – $20 so I am going to make it mine!!! Thanks for sharing! Love the scale done red!! 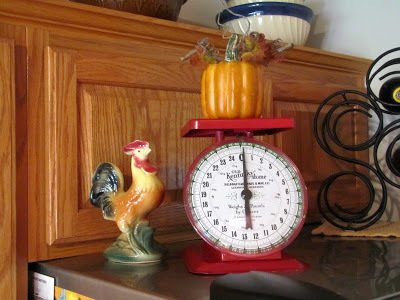 Very nice work on the scale your kitchen looks fantastic. I am the Ecommerce director at Lehman’s thanks for the props. I thought I would solve one of the mysteries of the world :). In addition to the local amish (that btw, tend to supply us more and more) and people without electricity, we also serve people who are looking to be more self sustained, people who are trying to be a bit more green, folks that look for things that they didn’t think were made anymore, etc. 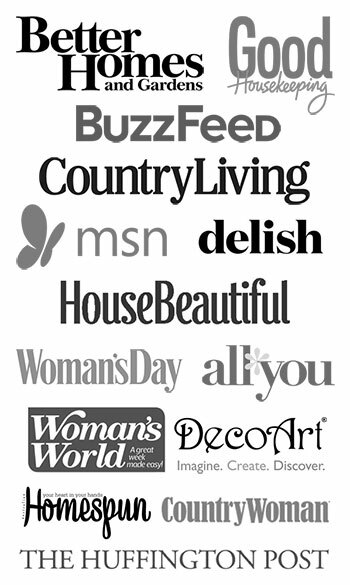 You might find it interesting that we sell many products to our friends in New York City, Chicago, and Los Angeles. We also have a facebook page, a youtube channel, and a blog. Go to the web site and on every page is a link. 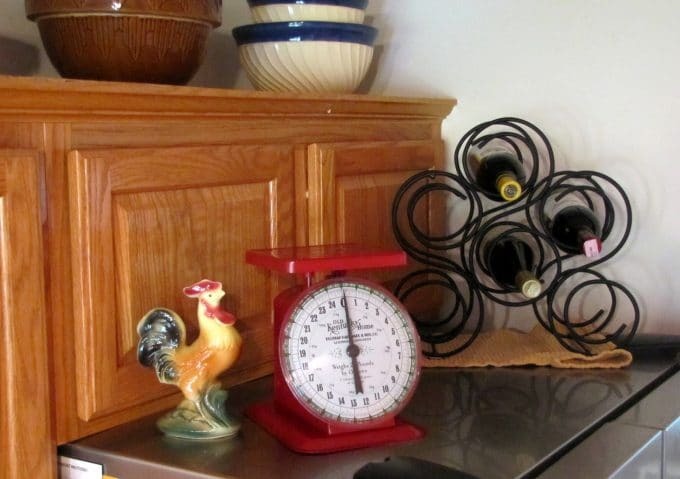 LOVE your kitchen reds and I really like the painted scale. I have one too and now you have given me a great idea!! Was it hard to paint??? Oh, your scale looks so happy painted red, Pam! The scale looks great painted red. What a great way to personalize it. 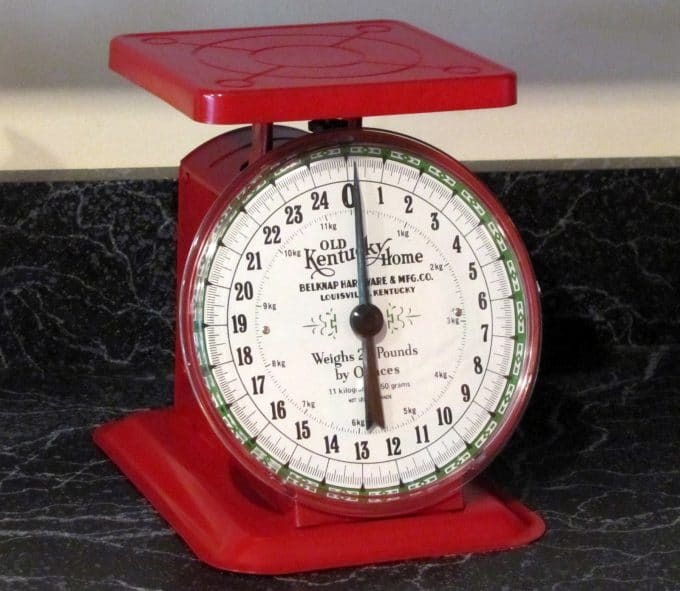 I would love to have a scale! And it it’s not red, I can paint it! Ooh, the scale looks so much better in red. That mitt on the hood is cute. Sounds like something my husband would do. Gotta admit it’s pretty convenient. Thanks for sharing and Happy Rednesday! I definitely love it red!! 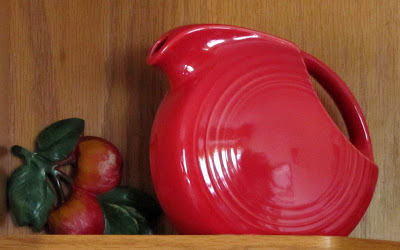 Love those bowls too and of course the Fiesta ware pitcher. Thanks for stopping by!! Lehman’s Greg – thanks for stopping by and clearing up that mystery! Pam- Now how in the world did Greg from Lehman’s even find you to know that you wrote about the store? Too funny- yup- Amish with internet! Love the “new” red scale. It looks classier and less “plastic.” Glad you could replace the pointer. Cool bowls, all of them. Ya know I like red! Sorry your privacy fence is gone, but I’ll look for your deer posts soon.